million for exports and $4,023.2 million for imports. influence of the strike on the statistics. above the calendar year 1970 total of $39,952 million. million in July and $4,283.1 million in June. IAdjusted for seasonal and working-day variation, but not for price level. :he Bureau of the Census, Washington, D.C. 20233.
date of erport is considered to be the date of mailing. 'Defined as exports (see footnote 1, above) minus general imports. *Revised subsequent to the release of June reports. 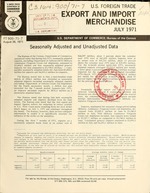 0Data for 1970 and 1971 reflect seasonal adjustment factors introduced in January 1971. 2Represents exports of domestic and foreign merchandise excluding Department of Defense Military Assistance Program Grant-Aid shipments. 'Adjusted for seasonal and working-day variation using seasonal adjustment factors introduced in January 1971.
tion, see footnote 2, table E-l1, Report FT 990, Highlights of U.S. Exports and Imports. sSeasonally adjusted figures for section 7 may differ slightly from the sum-of divisions 71, 72, and 73 since each is independently adjusted. 3In the absence of demonstrable seasonal patterns for this section, no seasonal adjustment factors have been applied to date. Use the "Guide to FOREIGN TRADE STATISTICS-1971"
imports and exports of the United States.